RCMP received a tip about a man "espousing extremist ideology" In 2015. Abdulahi Hasan Sharif, 30, has been identified as the suspect in Saturday's attack in Edmonton. 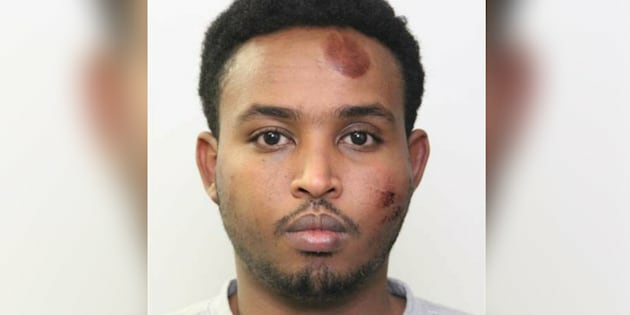 Two years before an attack in Edmonton that would leave one police officer and several others injured, Abdulahi Hasan Sharif was being investigated by the RCMP. Edmonton police confirmed Sharif's identity on Monday. He is expected to appear in court on Tuesday morning. RCMP launched the investigation, which included interviews with Sharif and others, after receiving a tip about a man "espousing extremist ideology," according to The Globe and Mail. RCMP Assistant Commissioner Marlin Degrand said the investigation concluded that he was not an national security threat. "At the end of that exhaustive investigation, there was insufficient evidence to pursue terrorism charges or a peace bond," Degrand said at an Edmonton news conference on Sunday. Sharif has now been charged with five counts of attempted murder, four counts of dangerous driving causing bodily harm, dangerous operation of a motor vehicle and one weapons-related charge, and is in police custody. Police say terrorism charges are expected, but none have been laid so far. He was arrested with an Islamic State flag in one of his vehicles. The attacks began Saturday during a CFL game between the Edmonton Eskimos and Winnipeg Blue Bombers on their military appreciation night. A driver of a Chevy Malibu rammed the car into a police officer handling crowd control outside Commonwealth Stadium. The driver then got out and began stabbing the officer, Const. Mike Chernyk. After Chernyk managed to fight him off, the suspect drove off. Police set up checkpoints in the area and began stopping cars, and held up a U-Haul van driver whose identification matched the registered owner of the Malibu. The driver then sped off into downtown Edmonton, eventually driving into a crowd of pedestrians on the city's busiest strip, injuring four. The officer, who suffered serious stabbing wounds to his head, face, and arm, is expected to make a full recovery. CORRECTION: A previous version of this story incorrectly stated that the Edmonton attack left one police officer dead. In fact, the officer was injured and is expected to make a full recovery.